Copyright 1997 - 2017 by James B. Van Bokkelen . This document may be duplicated and distributed for non-commercial purposes only, all other rights reserved. Maintained by James B. VanBokkelen (jbvbRemove_This@ttlc.net). (NOTE:"Remove_This" is intended to out-smart spam robots. You should do so in order to e-mail me). My New England RR index page. The Boston and Maine Railroad began as a second through route from Boston towards Portland, Maine, after the Eastern RR, incorporated in 1833 and completed in 1843. The next 70 years involved a great deal of financial and political finagling, but by 1915 the B&M reached from Troy and Saratoga in New York to Southern Quebec. This system map, from Employee's Timetable #4, January 4, 1964, shows what remained after the first surge of Interstate construction. The B&M was pretty parsimonious; few other Class 1 roads put as much energy into old equipment. Thus, the 1950s were particularly interesting: The steam-diesel transition began in earnest in 1943 with the arrival of the first EMD FT freight diesels. It finally ended in Spring 1956 after the first big order of self-propelled Budd Rail Diesel Cars replaced both WWI-era 4-6-2 steam locomotives and three- to seven-year-old diesel road-switchers hauling a dog's breakfast of second-hand steel commuter coaches. The B&M innovated with early diesel switchers, the Budd articulated streamliner The Flying Yankee , and the complete dieselization of the Hoosac Tunnel main line west of Greenfield by 1946. Conversely, the B&M ran one of the last big fleets of open-platform wood passenger cars, certainly the last hauling commuters into a major metropolis, and used ball signals and covered bridges well into the diesel era. I didn't see much of this personally: I can barely remember being taken to trackside at North Station in 1960 to see the last arrival of the Gull from St. John and Halifax. My own B&M memories are of the RDCs and Geeps going about their business during the long decline under indifferent ownership in the 1960s, and then bankruptcy and a revitalization that was finally smothered in Guilford Gray. Still, I find the pre-interstate era interesting to research and model, and thus I owe a great deal to those who documented it. Sincere thanks to the dedicated B&MRRHS volunteers who've prepared the B&M Bulletin articles I've compiled much of this information from, particularly Roger Hinman. I count myself lucky to have almost all the issues back to 1972, and hope that this effort will in turn be found useful by others. Thanks to Andy Miller for info on the ex-PRR cars. As I've prepared this, I've also been reminded how often it turns out that D. L. Ellis of Concord Junction Car Shops (Box 592, W. Acton, MA 01720) has made important B&M equipment available to the modeler, and my thanks go out to him as well as other manufacturers who give attention to the Route of the Minuteman. The B&MRRHS has an official web site which has information on current Society events. They also have a web forum. The B&MRRHS was organized in 1971. After a few initial photocopied publications, they began producing a quarterly glossy paper magazine called the B&M Bulletin with the Fall 1971 issue. Publication has continued fairly regularly: Volume 20 Number 4 came out in late 1996, but Volume 21 Number 1 didn't appear until late in 1998. Initially, all Bulletin photography was black and white; color covers began with the Winter 1978 - 1979 issue, and a few from the mid 1980s have color photo sections inside. Besides the B&M Bulletin , the B&MRRHS also publishes the bi-monthly B&MRRHS Newsletter , which includes a section called Modeler's Notes . The B&MRRHS has also published several softbound books (all presently out of print) and various B&M plans, datasheets, videocasettes and specially decorated kits. Members receive the B&M Bulletin and the Newsletter as they are issued. The B&M Bulletin is also available over the counter at some hobby shops, and the B&MRRHS has offered back issues and other merchandise at various New England train shows. The B&MRRHS has a sizeable collection of archival material, held at the University of Lowell, in Lowell, Massachusetts. The collection includes photographs, timetables, detailed track maps of most lines updated through the 1950s, the ICC Valuation Report from the WWI era, and a substantial amount of corporate information on the B&M and some of its predecessors. More information is available on-line from the ULowell Library , though there is no on-line catalog as yet. Before WWII, the B&M was typified by passenger equipment in the dark green scheme with imitation gold letters and a locomotive roster dominated by 2-6-0s, 2-8-0s and 4-6-2s. Heavy freight power included 2-10-2s, early Lima Super-Power 2-8-4s in 1928 and thirteen modern dual-service Baldwin 4-8-2s beginning in 1935. The largest passenger steam on the B&M was also built by Lima - two classes of heavy 80" drivered 4-6-2s built in 1934 and 1937. A few 4-4-2s and the survivors of large numbers of 4-4-0s and 4-6-0s filled out the main line roster, and 0-6-0s and 0-8-0s worked the yards and industrial districts. Use of the block herald scheme on locomotives began before the depression, but the 1911 scheme wasn't all gone for a decade. A large portion of the passenger fleet was still wood cars built before the turn of the century. Most, if not all of the survivors had steel underframes, but open platforms and truss rods were common. Monitor-roof steel heavyweights held down most of the intercity trains, though after 1934 "American Flyer" lightweight coaches replaced deluxe heavyweights on the showpiece Boston-Portland services. Gas-electrics with and without trailers handled many branch lines, and after the mid-1930s the Budd Flying Yankee and no. 1140, a large EMC motor-baggage car capable of hauling a 3 or 4 car train (unofficially known as the Sacred Cow ) served alongside the old and new steam. A few EMD SC and Alco HH-600 switchers arrived in the late 1930s, painted basic black . The B&M's last new steam engines were five R-1d 4-8-2s purchased in 1941, but they were followed in 1943 by four used P-5 4-6-2s purchased from the DL&W. Until late 1941, the B&M's standard structure paint scheme used #1A Gray with #2A Dark Green Trim. At that point it was changed to Cream with Maroon trim and wainscotting (where applicable). There wasn't a rush to repaint; many stations and other buildings remained gray ten or 15 years later. The Hoosac Tunnel electrification was a bottleneck on the shortest, most lightly-graded route to the ports of New England, which gave the B&M priority for twenty-four of EMD's wartime FT A-B freighters. After the war ended in 1945, the B&M sampled two E-7s, and then bought fourteen more in 1946. Five more E-7s in 1949 and a single E-8 in 1950 finished the fleet. Single F-2As were bought to complement A-B FTs, along with several F-2s, F-3s and F-7s in A-B sets. Alco supplied S1s, S2s, S3s, S4s, S5s, RS-2s and RS-3s, EMD supplied SW-1s, NW-2s, SW-8s, SW-9s, BL-2s and GP-7s, but the dieselization wasn't complete until six months after the largest-ever order of Budd RDCs arrived in 1955; The official last run of steam was a fan trip with P-4 3713 (under restoration at Steamtown) on April 22, 1956 but the remaining 4-6-2s and 2-6-0s on standby duty didn't make their last trips to Billerica shops until July. For most of this period, the Minuteman image was the prevalent paint scheme. The 1946 E-7s arrived in a short-lived Rock Island-like maroon and white paint, and many EMD and Alco switchers and the first RS-2 did their chores in the black with red nose stripes . Starting in the early 1940s, passenger cars were painted maroon, usually with dulux gold lettering and black roofs and underbodies. Twenty-four stainless-sheathed lightweight cars arrived in 1947 for the joint B&M - MEC service between Boston and Bangor, ME. Most of the open-platform wood cars were replaced by several large purchases of second-hand steel commuter coaches between 1940 and 1952, but some survived almost to the end of steam. The first Budd RDCs arrived in 1952, with no decoration on their ends. They began to receive Minuteman heralds soon after, probably next year, as road diesels started to get silver trucks. A few photos of RDCs show a number on the end between the fireman's window and the top of the Minuteman herald, but this wasn't universal. While profitable, the B&M wasn't profitable enough for its investors - the railroad was vulnerable to a takeover. New management arrived in the form of Patrick B. McGinnis, who had recently stirred up quite a bit of controversy during a brief tenure as president of the New York, New Haven & Hartford. While a great many of McGinnis' programs were window dressing for questionable financial manuvering, he did have a profound and lasting effect on the railroad from the modeler's point of view. First, a set of modernistic blue, black and white paint schemes were introduced with considerable fanfare. Then, more Budd RDCs were purchased, including single-motor RDC-9s without control cabs. All but the RDC-9s arrived with white ends sporting interlaced blue, black and white BM heralds. By late 1958 RDCs completely replaced all remaining locomotive-hauled passenger service other than interline trains. McGinnis also bought an ACF Talgo Train with the railroad's first and only Fairbanks-Morse locomotives, possibly to honor promises dating from his ill-fated lightweight train program at the New Haven. Finally, he took advantage of EMD's "buy now, pay later" plan to replace the FTs and a few other units with 50 new GP-9s in the "Bluebird" scheme . The new RDCs combined with the decline in overall passenger traffic to leave dozens of locomotives idle. The F-2s, RS-2s, E-7s and older switchers were scrapped rather than sold, hinting that maintenance had been neglected. McGinnis's machinations apparently favored his friends rather than the stockholders as a body, and a net began to close around him. He resigned as president in 1962, was indicted in 1963 and went to prison in 1966 for taking kickbacks on the sale of the 1947 streamlined passenger cars. The older RDCs quickly got white ends and BM heralds to match the newer ones, but after less than a dozen locomotives repainted in the initial rush, diesels that had been delivered in maroon and gold stayed that way. The joint management agreement with the MEC had ended before McGinnis arrived, but during his tenure the two railroads drifted further apart: The MEC didn't want to run either RDCs or the Talgo beyond Portland, possibly because it would have meant paying mileage rates to the B&M. Neither did they concur with the B&M's decision to drop most mail and express service as unprofitable in 1959. The few new B&M structures erected after 1957 were painted varying combinations of white/gray, black and blue. Existing structures with Cream/Maroon almost always retained it till they were demolished. 1960: RDCs beyond Fitchburg to Greenfield discontinued April 23. 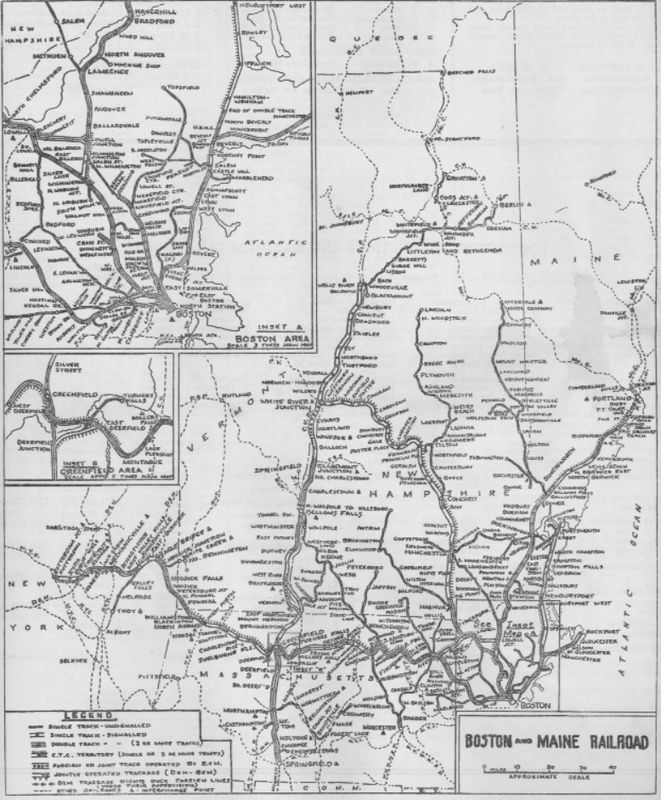 1964: RDC service to Laconia, NH cut back to Concord, NH. 1965: RDC service to Portsmouth, NH discontinued in January. One except-Sunday round-trip to Newburyport restored later in the year. 1964: RDC service on the Fitchburg Division cut back to Ayer, MA. During this period, older locomotives were gradually scrapped or sold; The motive power surplus continued and many B&M engines and even a few RDCs spent a year or two out on lease. The BL-2s and one F-unit went to EMD as trade-ins for six GP-18s in 1961, the only new locomotives purchased during the decade. Some surplus RDCs were sold to the CNR, CPR and RDG; a few more were destroyed in accidents. In the late '60s, the RDCs started to lose their white ends, receiving BM heralds applied to bare stainless steel as the Minuteman had once been. Simultaneously, a new solid blue scheme started to appear on switchers, GP-7s, Fs and RSs shopped for major overhauls. When "pay later" time for McGinnis's schemes finally came in 1971, the B&M hit bottom. A fortunate choice of trustees helped start the revival, and energetic executives like John Barriger and Alan Dustin contributed a lot, but the key part came with the Metropolitan Boston Transit Authority's use of Federal funds to buy the Boston commuter district, track, RDCs, stations and engine facilities. 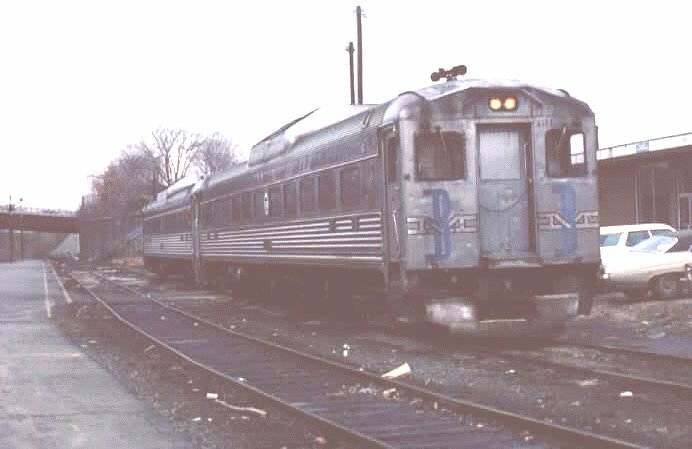 The B&M continued to operate the North Side commuter service, and even took over the former New Haven and Boston & Albany operations out of South Station when Conrail wanted out of the commuter business. Several New Hampshire branches were abandoned, but this was momentarily balanced by taking over some ex-NH and ex-NYC trackage in Massachusetts and Connecticut. New power arrived in the form of twelve GP-38s in 1973 and eighteen GP-40s in 1977, painted in variations of the solid blue scheme . The GP-40s idled many of the GP-7s, and this, combined with a 1977 decision to remove the enclosures from the RDCs' underfloor diesel engines (officially due to risk of fires from oil leaks) doomed the RDCs as self-propelled units. After the harsh winter of 1977-78, most were reduced to push-pull coaches, with one underfloor diesel idling to provide heat, light and occasionally air conditioning. It's peculiarly ironic that the GP-7s worked out their last few years hauling de-motored RDCs on the commuter services the RDCs had displaced them from 20 years previously. The MBTA applied various new purple-themed paint schemes to the RDCs as they went through the shops, and finally eliminated decrepit ex-NH power and units leased from the B&M and D&H by buying its own F-40PHs and rebuilt F-units. Some RDCs were used as cab and steam generator cars with ex-NH coaches in this era. More RDCs were rebuilt by M-K in Boise to coaches with the radiator blisters removed (Boise Budds). Alas, modifications to the suspension made them noiser and rougher-riding than originally. All were disposed of as the MBTA expanded its builty-new coach fleet. Once in a while I feel nostalgic for the pre-strike days, when B&M, MEC and D&H power mixed on the Freight Main Line (Bangor - Binghampton). Then I think of all the traffic and opportunities lost, of seeing trains sit a day or more on the main track waiting for crews and the long battle with Amtrak and the State of Maine over Boston - Portland passenger trains, and the feeling passes. I'll leave the rest of the story (and modeling it) for others. This is a start, and mostly reflects books that I myself have. Eventually, as I get information on other sources I will expand it. I've found useful B&M content in all of them, though some cover other railroads as well. The order is roughly chronological. B&M Cabooses - A History of Devlopment & Use 1914 - 1955 by Tim Gilbert (B&W, Salisbury Point Railroad Historical Society 1999).